My Little Sailor, the co-author of 52 Quilts is stationed in Japan with the US Navy. He extended his assignment to Japan for two more years, so he got to take an entire month's leave. We enjoyed a lovely family vacation in Manzanita, Oregon (thanks, Betty, for telling us about your town!). Then MLS and Mom drove down the coast to San Francisco and across The Loneliest Highway back to Colorado. We had a wonderful tine, but now I need to get back to work! And now, for the September finishes . . . . The first finish sent in was this cute BOEOW -- that's Block of Every Other Week -- "Deckade," made by Debra. She reports the QAL was from June 2013 to October 2013. and the quilt finishes at 62 1/2" X 71 1/2". 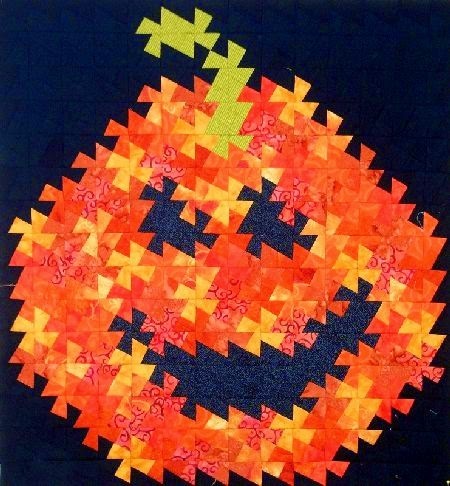 Sponsored by Fat Quarter Shop, go to their blog, Jolly Jabber, to find the pattern. So cute, Debra -- and what a great scrap-buster! I've decided to donate mine to a veteran as it is just too symbolic a quilt not to. My project is called Kadence. Kerry quilted it for me in the best patriotic theme stitch around. It is by Anne Bright called American Heroes. It has several iconic statues in it along with fitting words like respect, pride, honor, and thank you. [The photo is of] my project just before I attached the sleeve and binding. 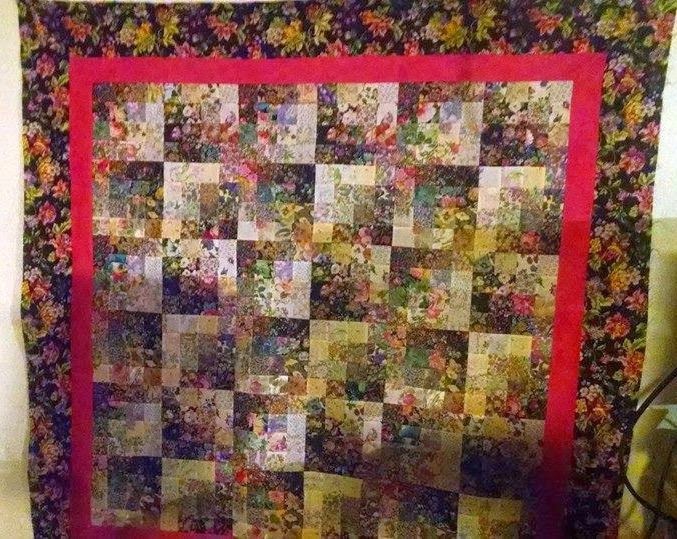 Here is a link to a full photograph before the quilting. It is #5 in my list of 2014 UFOs. 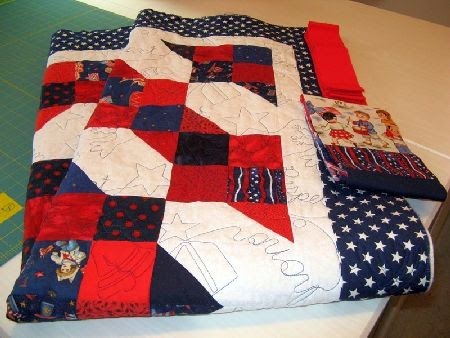 Sandi, some vet is going to love this quilt -- thank you for supporting our veterans! 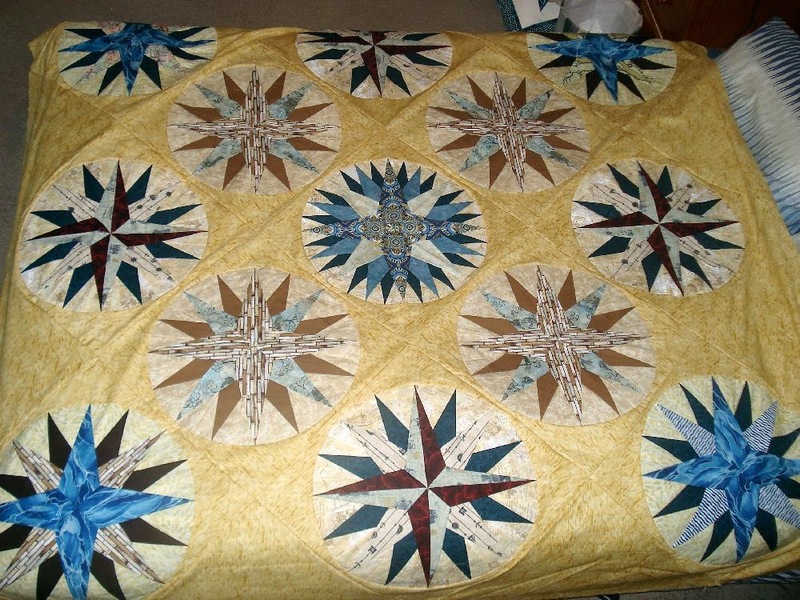 Sue sent a photo of her finished Mariner's Compass flimsy. I can certainly see why this became a UFO, Sue -- wow, what an undertaking! See the story behind Sue's Mariner's Compass and more photos of her crumbs blocks at Sue's Qulty Bits and Bobs, here. Donna is planning to quilt her watercolor quilt using skills learned in the Craftsy class on walking foot quilting. If you're not a member of Craftsy (it's free, and they often have free patterns!) go here to join. The second is a group project where my quilting friends each made a block based on a post card that had 6 birthday cakes. I made the bottom right pineapple block since I went to high school in Hawai’i. I used variegated ribbon to make the pineapples. We share the quilt depending on whose birthday it is and I am September so it is currently at my house for the first time so I included it this month. What a fun idea, Donna! I have the same quilt Kerry made in my UFO bin! You inspire me to dig it out and finish it right quick before Halloween. 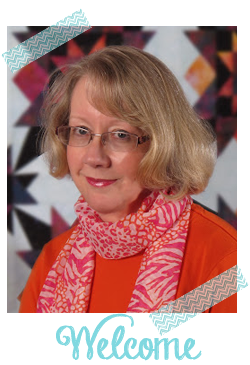 Kerry says "It's like making a quilt twice, but the results are worth it." She is so right -- see the details on her blog, Kerry's Quilting, here. 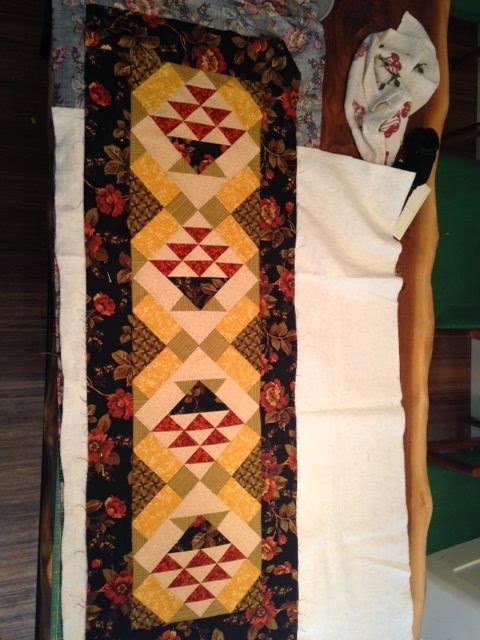 I love the Thanksgiving table runner Martha finished this month. The colors are just perfect for Fall! Read the details of both "Peaches & Dreams" and "Woven Together" on her blog, Peachy Pages, here. RNG brings up Sandi as the winner for the UFO Parade giveaway. Sandi, I've sent you an email asking for your postal address so I can send you some Moda candies and a Little Bits pattern! Of course, you already know I finished nothing -- nothing! in September. 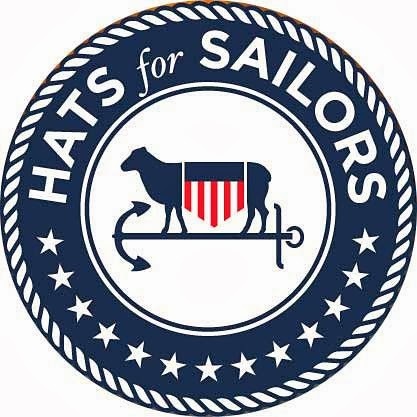 But I had a great time visiting with My Little Sailor, and I'm ready to sew like the wind through October. Can't wait to see what you all finish this month! Thanks so much for the parade. I need to get some finishes underway, too! Sewing stars and hexies today. Have a super day! Another great roll up! 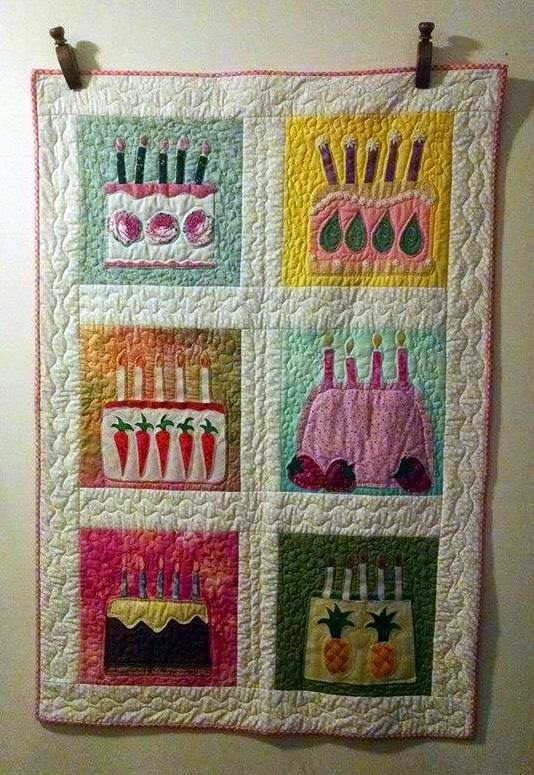 Love the idea of the birthday cake quilt. 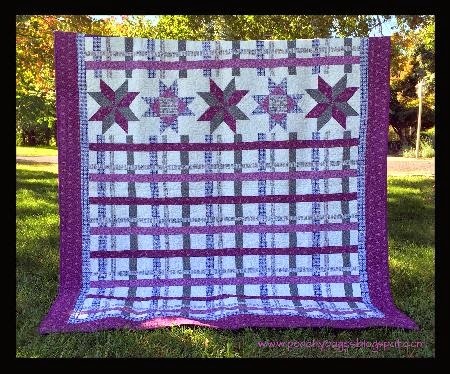 Heather, I think I saw your blog earlier because I fell in love with your plaid quilt. I was able to find the pattern, order the magazine, and now it is in the stash for 2015's UFOs!! Thank you for sharing. Way to go to everybody! 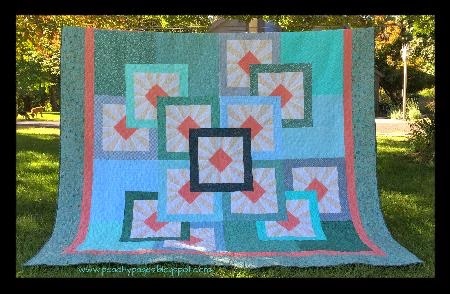 I love the idea of the birthday quilt being shared around, just like a real birthday cake! Lots of wonderful finishes again this month, well done everyone! 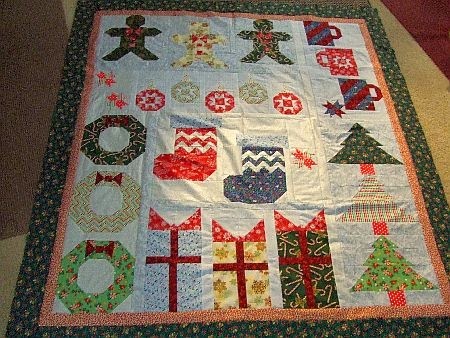 I really like the Christmas quilt that was a free pattern. I bet you loved having your son home. Whilst it's good he knows his posting for two years I bet it's hard being so far away for so long.